No, no…no worries. I’m not doing crazy science experiments on my poor little yard chickadees! What were you thinking?? 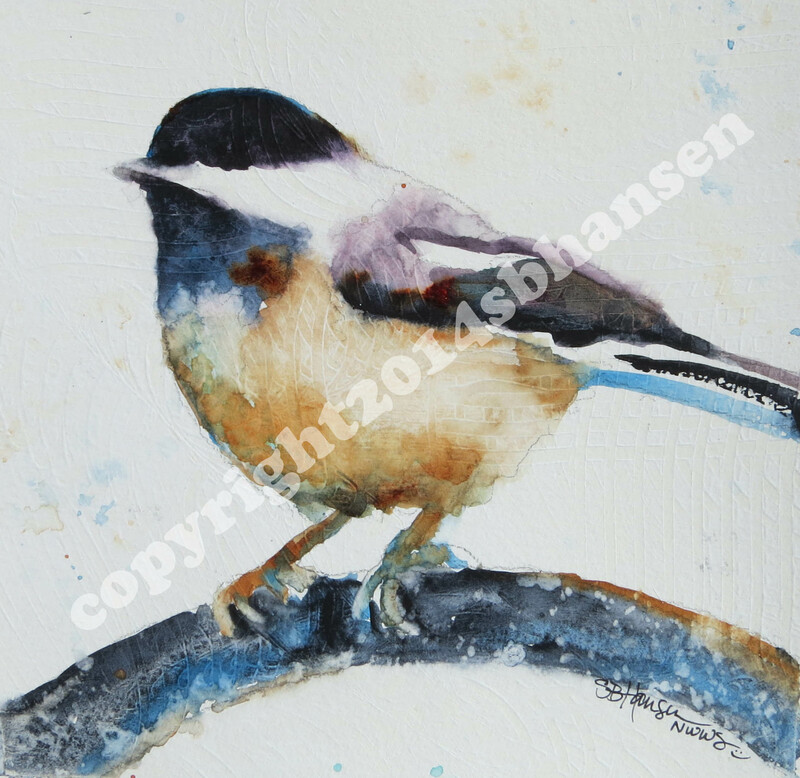 This small chickadee painting went together so smoothly and that I found it hadn’t quite quenched my yelling beast within. It was so fun and quick I had to do another. Okay, okay, I didn’t really need to, but there was an uncontrollable desire (you must do another, Sarah)! I enjoy pushing colors in my paintings. 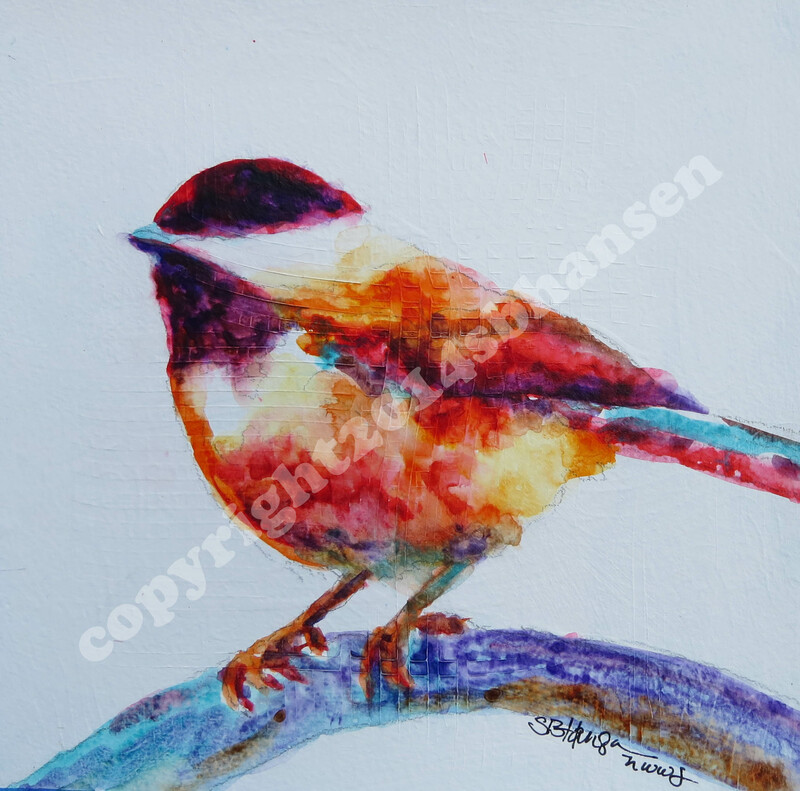 The bird does not necessarily have all the colors on his little feathers as I have depicted. But if I wanted him to be perfectly rendered, I could always just post the photo. And you all know what a disappointment THAT would be. 😉 The colors are pushed to more extreme; the blues are more intense, the black is actually purple, but he looks pretty normal, right? I think I’d like to do another one with weird colors (queue uncontrollable desire to paint another). What fun this is! Isn’t he cute? What made him even more interesting was that I had just purchased a new paint, Daniel Smith’s Quinacridone Coral. Gorgeous color! You will be seeing more it from me in the future. It’s a warm red, so it mixes very well with a warm yellow such as New Gamboge Yellow. I LOVE it!!! So? What do you think? Which version do you prefer? Comment and let me know. Hope you all are feeding your creative beast this week! Follow me on Facebook and check out my online store sbhansenart@artspan.com. You are so talented! The video is awesome, so cool to see a painting from start to finish. I love both of the chickadees but the first is my favorite. That color that you used in the tail (light blue) is awesome!